When a NASA probe in orbit around the moon captured close-up photographs of several Apollo landing sites, relics of the lunar visits — like human tracks and discarded hardware — could clearly be seen on the dusty surface. But, while the artifacts seem well preserved on the lunar surface, scientists don't expect that to be the case in the long run. The Apollo landing site photos zero in on the paths made by the visiting astronauts and their lunar rovers. They also show where the explorers left experiments and discarded unnecessary hardware before returning to Earth. "They won't be there forever," Mark Robinson, an Arizona State University scientist and the principal investigator of LRO's camera, said in a news briefing today. "The moon is constantly bombarded with micrometeorites. These are very, very small particles that impact at very high velocities." Robinson estimates that these impacts occur at more than 33,000 mph (53,000 kph). These collisions will eventually wear down the tracks and objects left at the landing sites, he explained. "Slowly over time, first the tracks will disappear — they will all be ground into and mixed into the soil," Robinson said. "And then, the smaller pieces of equipment will disappear, and eventually the descent stages will get probably blasted with a larger asteroid." From past studies of moon rocks collected by astronauts during the Apollo missions, researchers have learned that the rocks erode at a rate of about 0.04 inches every 1 million years. "In human terms, it may seem like forever, but in geologic terms, probably there will be no traces of the Apollo exploration in, let's say, ten to a hundred million years," Robinson said. The eventual disappearance of human traces on the moon could be incentive to somehow protect the sites where the Apollo astronauts landed and explored. "The moon doesn't have an atmosphere, so that makes it such that features seem more permanent because you don't have erosion, either by wind or water, to make those features disappear as quickly as they would on Earth," said Robert Pearlman, an expert on space history and collectibles, and editor of collectSPACE.com, a SPACE.com partner site. "But it's a dynamic environment, so nothing is forever. So, unless we take action to protect those sites, then natural forces will have their way." In 2009, LRO previously took photographs of the Apollo landing sites from a higher altitude, and curiosity arose about whether the American flags that were planted in the ground during the missions were still standing. Based on the new images, that mystery may remain unsolved, but Robinson is skeptical that the flags are intact, if they are still there. The moon's extreme heat and ultraviolet conditions would probably destroy the nylon flags over time, he explained. Yet it is possible to detect where the flags are planted in the new LRO photos, Robinson added, because the "astronauts tramped down the ground an extra amount there." 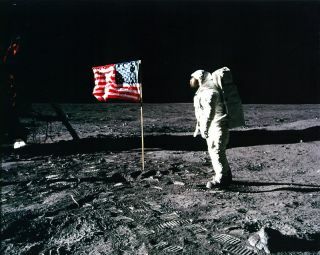 Unanswered questions about the American flags on the moon could fuel conspiracy theorists even more, but Pearlman thinks they represent further proof against supposed hoaxes. "I think it actually bolsters the idea that we actually did go," he said. "We didn't design a special American flag to go to the moon to last thousands of years. They literally sent out a secretary to the nearby Sears and bought an off-the-shelf flag and modified it." The natural disintegration of the flag's material in the harsh conditions on the moon's surface is to be expected, Pearlman said. Still, the new LRO images will do little to sway firm believers in the Apollo conspiracy theories, he added. "If they believe we actually faked going to the moon, then the idea of taking an image like this and adding a couple of dark pixels is way too easy," Pearlman said. "They're not going to be swayed. But, for everyone else, it's a new view of a great accomplishment."